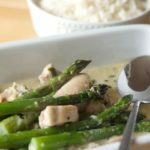 Skinny Creamy Asparagus Chicken - Quick, easy and oh so good! 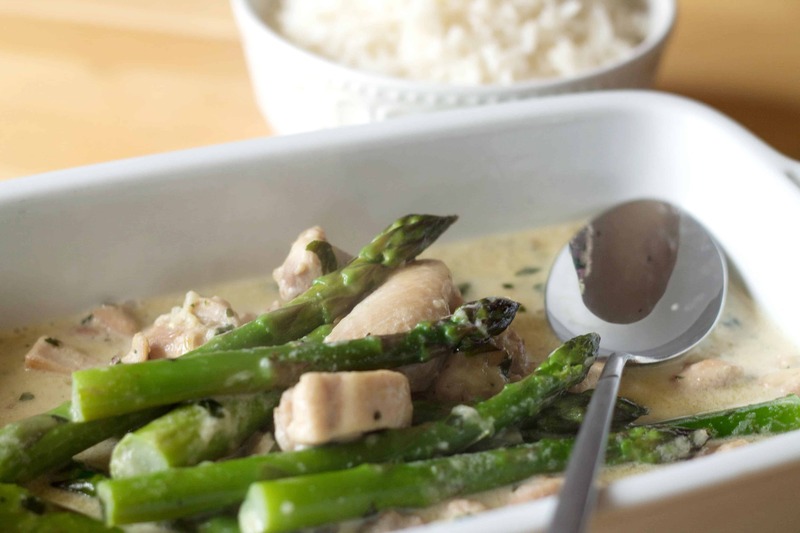 This Skinny Creamy Asparagus Chicken recipe makes a light, low-calorie dish with a silky cream sauce tastes like indulging without the guilt. 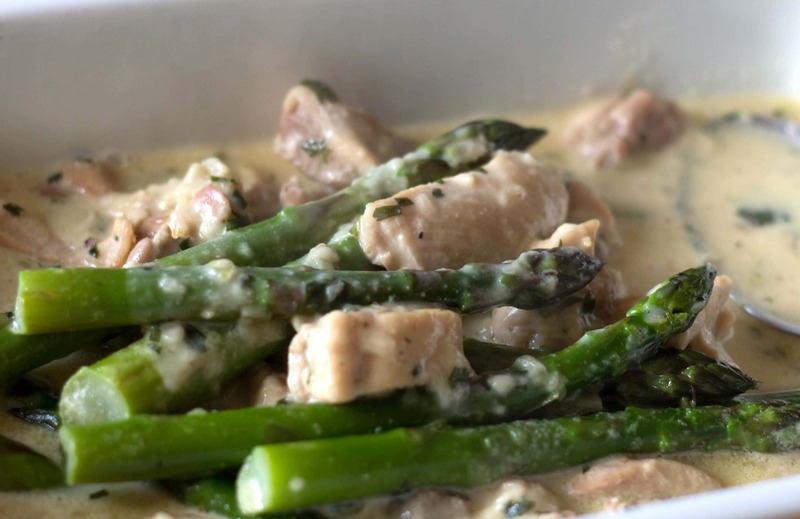 This luxurious recipe for Skinny Creamy Asparagus Chicken makes a light, low calorie dish with a silky cream sauce that will make you feel like you’re indulging without the added guilt. The best part is that it’s ready in about 20 minutes! If you’re a regular visitor to this blog, you might notice a bit of a difference in my usual photo quality. I usually stage my dishes and set them up in the best quality lighting that I can get, but that’s not at all what you’re getting here. On this post you’re getting some quick snaps of our dinner before sitting down. I often photograph our dinner preparation when I’m working on a new recipe. When I know I’m on to something really good and there will be no chance of leftovers for me to stage and shoot later, I’ll snap some photos quickly while my husband huffs and threatens to write a guest post on what it’s like to live with a food blogger. This dish bothered him more than most because regrettably, the asparagus got a little over cooked sitting in the sauce while I snapped the photos, but hey, living with a food blogger also has it’s perks so hopefully, it balances out. I was right when I chose to photograph this dish before sitting down to eat because it was absolutely fabulous and there was nothing left over to shoot the following day, but I’ve decided not to worry about food styling and to share the recipe just because it tastes too good to wait! I love asparagus, but I don’t make it very often. Every time I do, I almost without fail say how I should make it more often. I recently had someone tell me that they only buy baby asparagus because the bigger kind is too tough. 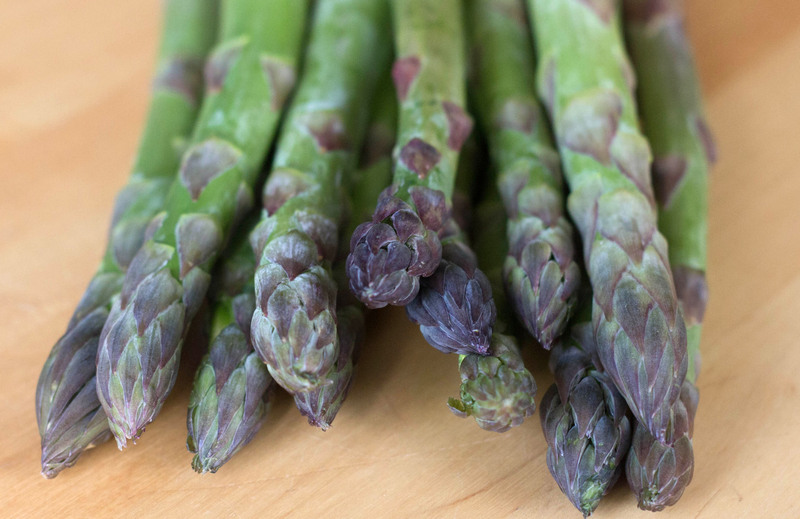 I’ll tell you what – if you but asparagus when it’s in season, it will be tender no matter how big the stalk is. The key is to trim it in the right spot. If you hold it end to end and bend it until it breaks, it will snap at the right point so there will be no woody end. Doing it this way will ensure that you never cut off too much or too little. 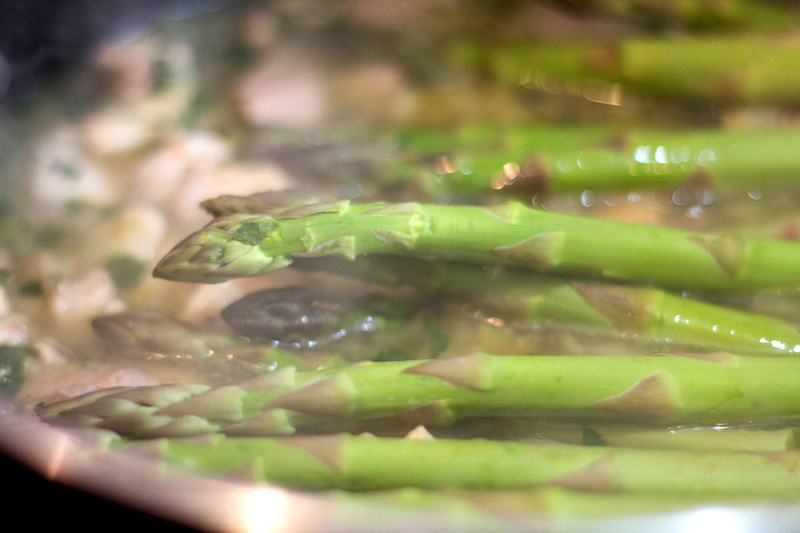 Your asparagus won’t be uniform in size, but it will be tender. Now onto the dish. I started with browning the chicken. 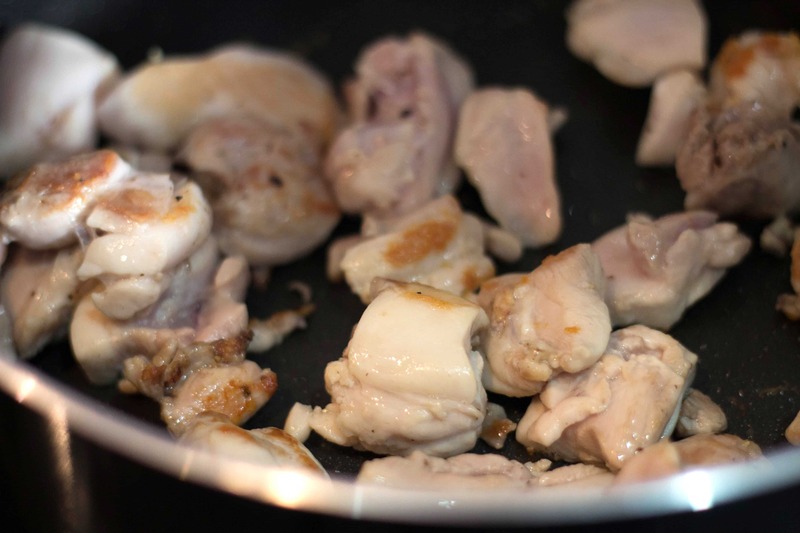 I almost always cook with chicken thighs, but if you prefer breasts, knock yourself out and use it. Next, I added chopped onion and garlic and gently cook another 5 minutes. Then I added chicken stock and let it simmer another 5-7 minutes before adding the asparagus and low fat cream & cook for about 3 more minutes. I served it with rice, but you can serve it how ever you like. Season the chicken with salt & black pepper. Heat the oil in a large non-stick frying pan. Gently fry the chicken until brown. Add the the onion and garlic and cook for another 5 minutes until soft. 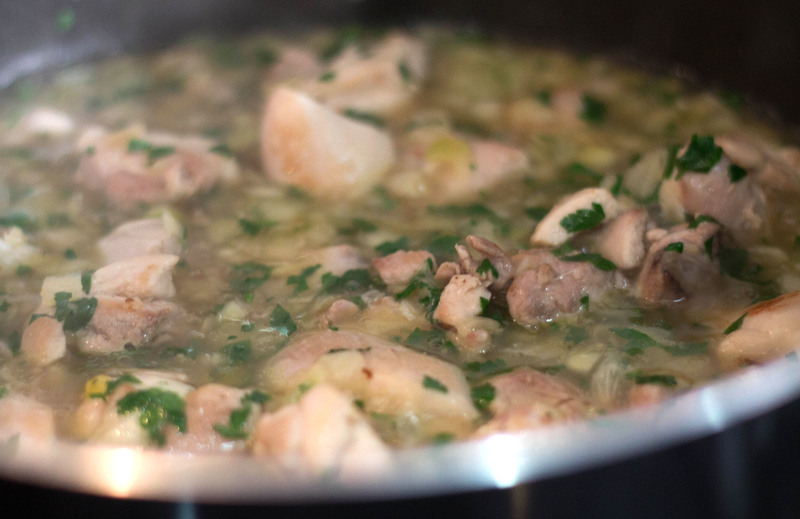 Pour over the stock, and bring to a gentle simmer. 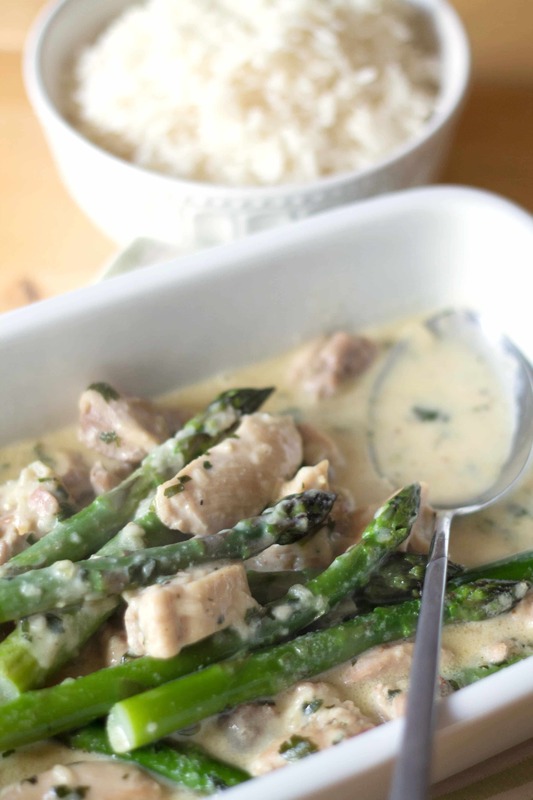 Cook for 5 mins, then add the asparagus, cream and parsley and cook for 3 mins more minutes. I became a little idle and started browsing the web when I found this post. It’s not bad at all. In fact, I actually like it.